Donate an unwrapped toy at Toys on Patrol. There will be a car show and photo with Santa & Mrs. Claus at Erwin Street Mall Courtyard in front of Van Nuys Police Station. My wife, kids and I started collecting toys at a local Japanese classic car meet also known as “OJCM” (Old Japanese Car Meet) or “Oldskoolerz” that meet every Friday night next to the Bob Hope Airport in Burbank, CA. With the help of the car enthusiasts and local businesses who participated, I started “KAR (Kindness At Random) 4 Kids toy drive.” Our goal was to collect toys to support the Van Nuys area Police Station anonymously since 2012. Since “KAR 4 Kids” successfully collected over 500 toys in December 2012, I introduced the “Toys on Patrol” idea. With the support of the Senior Lead Officers and Commanding Officers we were able to collect more toys from local businesses that supported our cause. We received over 1000 toys in December of 2013. LAPD has supported other toy drives in the past along with other agencies, such as, “Toys for Tots” by USMC or “Spark of Love” toy drive exclusive for Firefighters just to name a couple. But “Toys on Patrol” is unique! “Toys on Patrol” successfully provided a toy for over 1000 less fortunate kids in the Van Nuys area in just a couple of weeks during the month of December 2014 and has consistently done so for the past years after that. This simple act has made a positive impact on families, officers and most important, kids in our community. Seeing the expression of kids, along with the parent’s positive response is unparalleled. I am humbled by having the pleasure of sharing the same experience with my fellow brothers and sisters in blue when giving toys to those kids in need while on patrol. We as officers see firsthand what kids – are truly in need. Hence why we DO NOT offer handouts at the police Station or distribute the toys at toy banks such as other toy drives. Instead, the collected toys are kept at the Van Nuys Station. On duty LAPD patrol Officers take 4-5 toys to their patrol cars at the beginning of their shift. The toys are then given to kids or families “DEEMED IN NEED” by patrol Officers during their shift between patrol and calls of service. Officers concentrate in the less fortunate areas or neighborhoods throughout the division to carry out the mission. 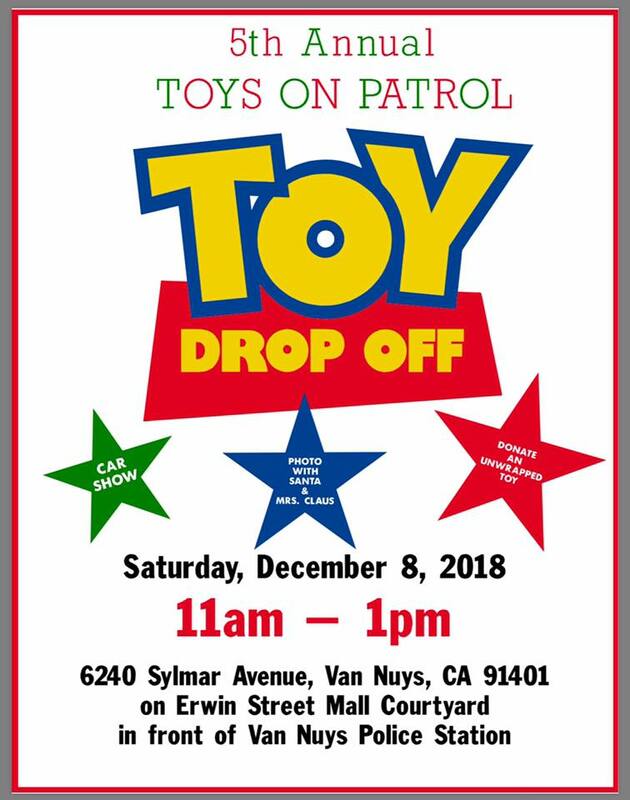 On December 8, 2018, the LAPD Van Nuys Area Police Station, will be hosting the “Toys on Patrol” Toy Drive and Car Show with celebrity cars like the Back to the Future car, Vintage L.A. Coppers (1940’s), Knight Rider, Santa Claus, Mrs. Claus and others. The event will be from 11 am to 1 pm and will be held at the Erwin Street Mall courtyard which is located between Van Nuys Blvd. and Tyrone Ave, next to the LAPD Van Nuys Area Police Station located at 6240 Sylmar Ave. It is an event open to the community who wish to participate by donating a new unwrapped toy(s), game(s) or stuffed animal(s) (no minimum value) on the day of the event or “walk-in” the station at anytime 24 hours a day during the month of December. Our goal is to collect as many toys to support our exclusive “Toys on Patrol” program.